I’m so happy to share this video version from my new Modern Pioneering series. 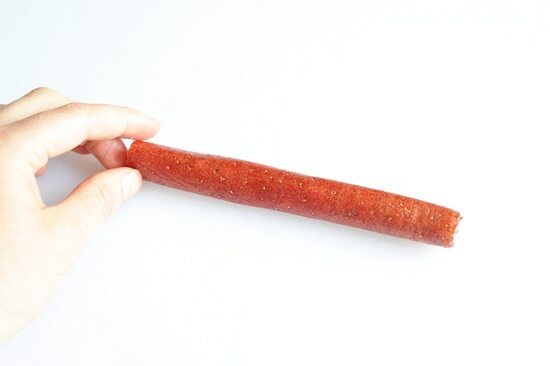 Fruit roll-ups were a big thing when I was growing up. There were so many iterations at one point that I was in pure fruit candy bliss. Then there were the healthy versions that we’d always find at the health food store. 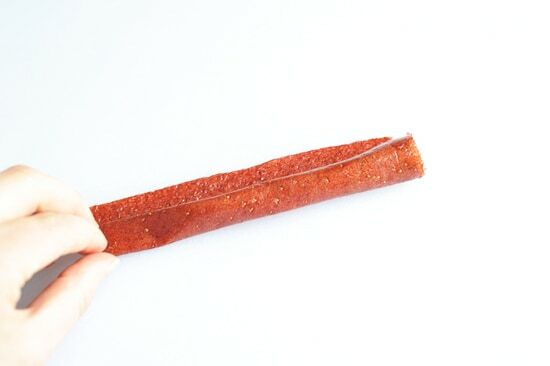 They were called “fruit leather,” because they were thicker and made out of pure fruit I suppose… not the other nasty bits that were probably in the fruit roll-ups. My editor told me that they needed a few more recipes for my book Food Heroes a little while ago for “layout” reasons. And since I had so many strawberries left over from the pie and shortcake I made, I gave this home made fruit leather a whirl. I may or may not have eaten the entire tray. Here it is on video. Here is the visual step-by-step. 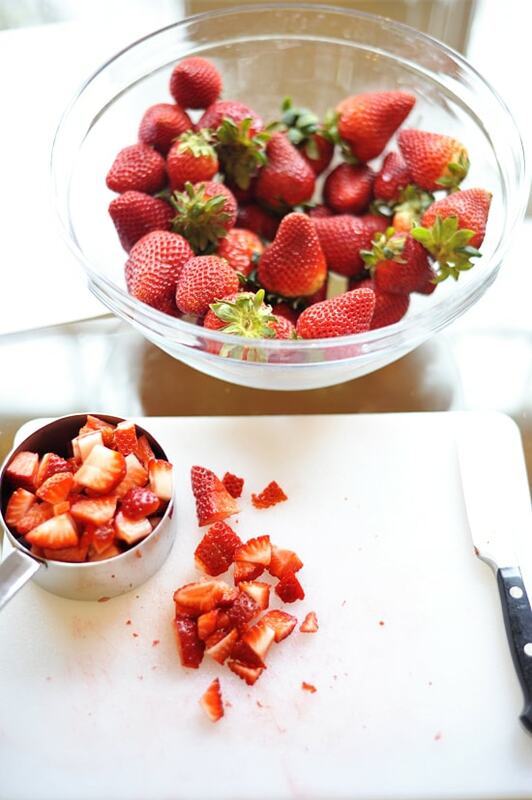 You start by dicing up the strawberries into small pieces. Then in a pot they go, with a bit of water. And a squirt of lemon juice. Then you stew them. Mostly covered, until they are very very soft and mushy. 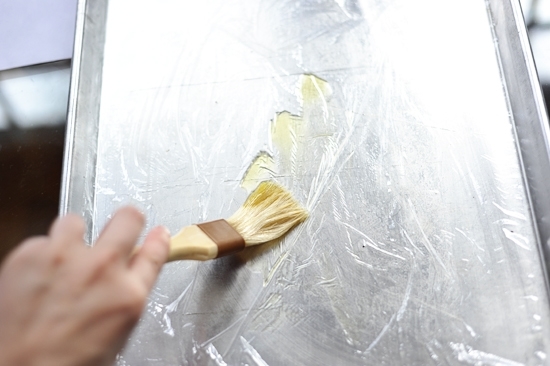 Next you place some plastic over a sheet tray and brush it with olive oil. 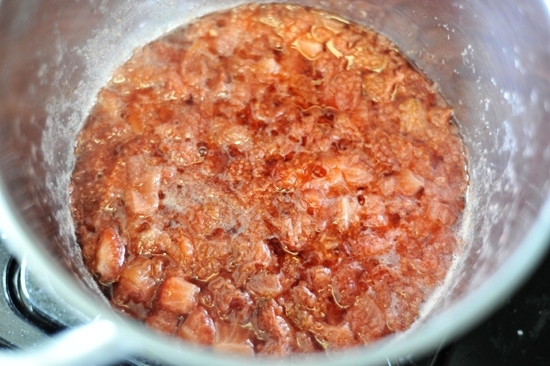 The stewed fruit should look like this, at which point you transfer it to a blender. Taste it and if you think it could be a lot sweeter add some sugar. And blend some more. 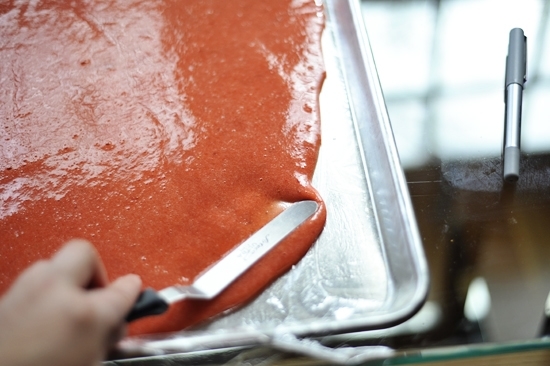 But before you go and add a lot of sugar, keep in mind, that as the fruit leather dries, it will concentrate the natural sugars in the fruit and it will become sweeter on its own. 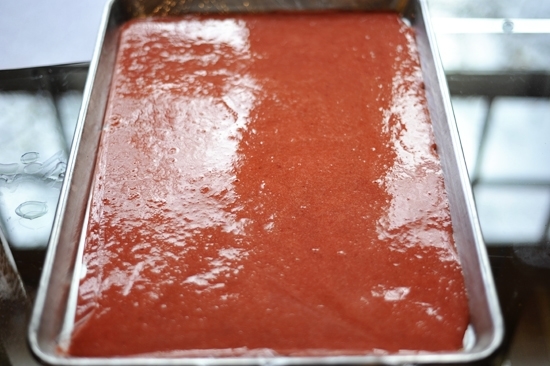 Pour the mixture on the plastic covered tray. And with an offset spatula, spread it around evenly. Then it goes into the oven for what seems like years, but is really just many hours on a very low temperature. So low in fact, that you may need to keep the oven door partly opened. Then you score it into the size that you like. 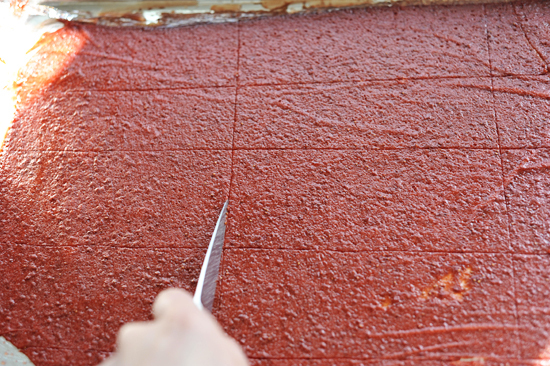 These rectangular shapes are the fruit leather size. It will peel right off. Give it a little roll. Give ’em a try sometime. They’re thrilling. Preheat the oven to 150 -170 degrees F. If your oven doesn't go this low, simply set it to the lowest temperature and prop the door open. Wow this looks so incredibly fun! I definitely want to try this soon! How long would these roll ups last out? Or should they be kept in the fridge? Hahahahah, how long do they last? In my home about 10 mins followed by Tums. This is brilliant! Which other fruits could I try it with? Great job and I love the photos! 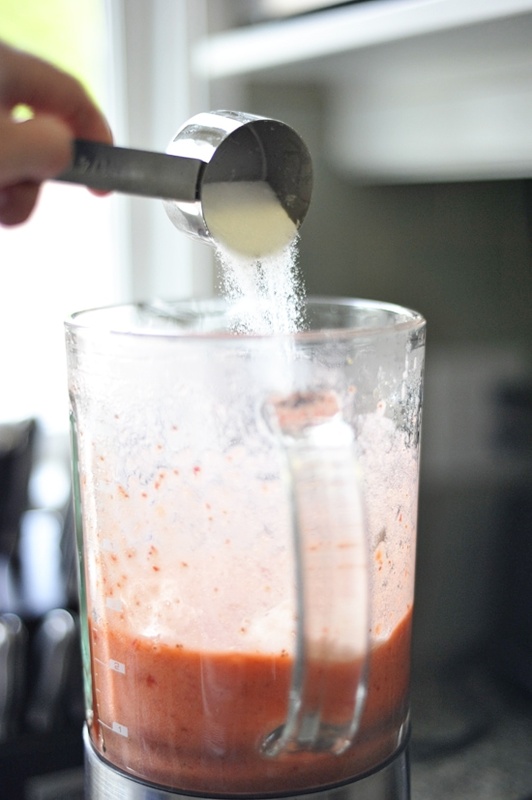 You can try most things really… persimmon, berries, mango… things that you can stew and turn into a puree. Enjoy! okay wow. this looks so so easy and delicious! 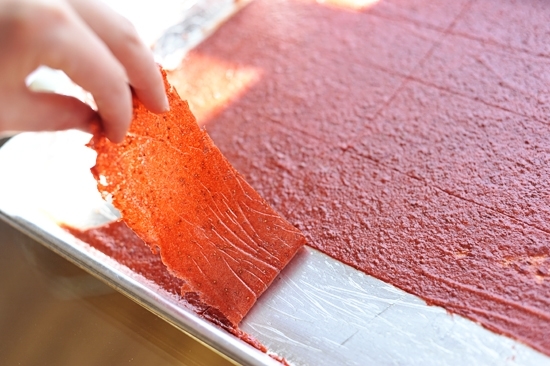 I hated fruit leather back in the day, but making it at home would ensure deliciousness. do you think this would work well in a dehydrator? Yes, a dehydrator would be great if you have one. what kind of plastic cover are you using…is that the cling wrap type? or something else? really ignorant here LOL! Whaaaaa! This looks so easy! I'm so going to give this a go. Thank you for the inspiration. I have never seen a recipe for these, and I'm so glad I found this! 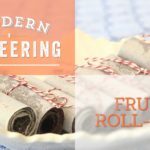 Fruit roll ups can be so expensive, and you seriously have no idea what it in them.. I'm happy about this one because it is very basic and has perfect simple ingredients. YUM! Hi Becky, if you look at the photos, you'll see I have step-by-step visual guide. 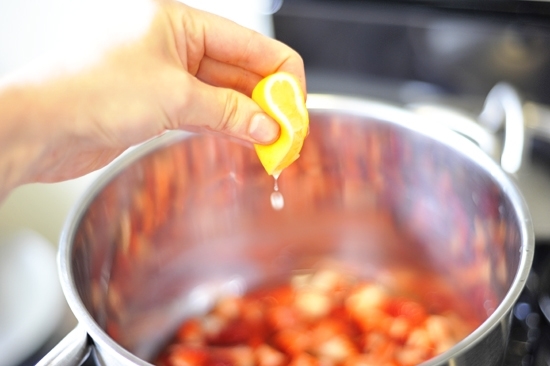 It's simply a bit of water and a squirt of lemon juice in a pot covered on low heat. But how much water for how many strawberries? hey georgia! I tried this and it didnt turn out at all! 🙁 after only about 6-8 hours it was all crunchy and almost burnt-like. it shrunk a lot too. also my plastic wrap melted and stuck to the fruit and my baking sheet. i left the oven door open the whole time make sure it wouldnt get too hot. what did i do wrong?? It sounds like your oven temperature might be off and needs to be recalibrated. Do you have an oven thermometer you could stick in there to test it? 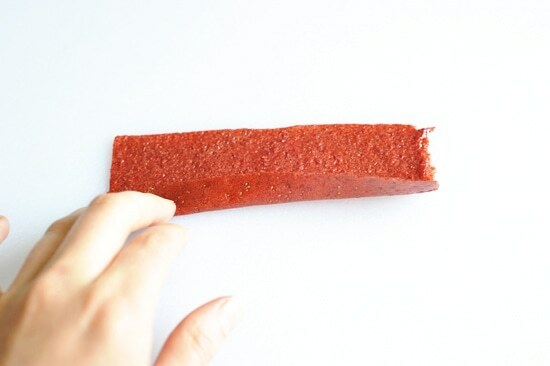 If the fruit leather just seems brittle, then it’s just a matter of brushing water on it with a pastry brush, but the plastic should definitely not be melting at that temperature. Some people have also used wax paper with a lot of success, but plastic wrap has always worked for me. My oven must be the same or maybe it is just these electric ovens which I call easy bake piece of junk ovens. I did it again no plastic door open and it worked. I’ve made roll ups with a different recipe and used parchment paper, which seemed to work well. Keeps it from sticking to the pan, and you can just cut into strips and roll up with the paper when they’re done! I’d also check them often he ones I made before only took about 3 hours…. okay I’ll check my oven temp and try to work accordingly, thanks so much!! can’t wait to try this again! Even if your oven is off, you could start with testing it at 2 hours and test every hour after that and it should still work for ya. The pastry brush with water will take away any crispiness. I’d be worried about the carcinogens from the plastic wrap. Once it’s hot, the chemicals seep out. Have you ever tried with parchment paper? I wonder if that would do the trick. Looks yummy! Yes, parchment paper totally works well, use that! Making these right now and they smell so good. They make so much more then I would get from a package of fruit leather for half the price. I am so excited to try them. Wow, what a wonderfully intriguing idea! Please let us know how it turns out! Do you have to use plastic wrap or parchment paper? What would happen if you just put it on a sprayed with cooking spray baking pan? It might stick, but you could try it. You could also try using a silicon pad which would work well. Would this work with splenda? or the splenda baking blend??? They sound delish!!!!!!! I would suggest just using really sweet fruit. Or a pinch of stevia or honey even. Splenda might get funky in the oven. Though everything is worth a try! hey, do you think it can be made with vegetables? what could i use instead of sugar? This would be great to make sweet sushi!! Hi Laila, fruit has a natural pectin that allows the fruit to gel, so you would probably have to add pectin if you were going to use vegetables. That would be fun to try though, so creative! If using fruit, you don’t even need to use sugar if it’s very sweet fruit, but if you want to add a sweetener, I enjoy using stevia, agave, or honey, which are healthy alternatives. Enjoy! So you have to put it in the over for 6 hrs twice? Oh delicious! Blackberries will be so good here… fun seeds and all. Can you use frozen fruit too? Will definitely add to my list of things to make when fruits are in season next year! Do you think I”d have to leave it in the sun over 6-8 hours in 108 heat index heat here in South Louisiana or should it be done sooner??? It’s hard to say, because it would depend on your humidity as well. I would choose the oven if you have a humid climate..
Ahh okay! I did end up doing it in the oven. Unfortunately, just after 3 hours, it was completely stuck to the parchment paper (and I DID put olive oil on it…maybe I didn’t put enough?) and the paper was stuck to the baking sheet. I tried putting water with a pastry brush over it, but would it already start looking ‘crispy’ after only 3 hours?? It depends on how small the pieces are. But the idea is to cook the flavors together and then puree it. So it won’t be fully ready until it is smooth, which happens in a blender. Cheers. 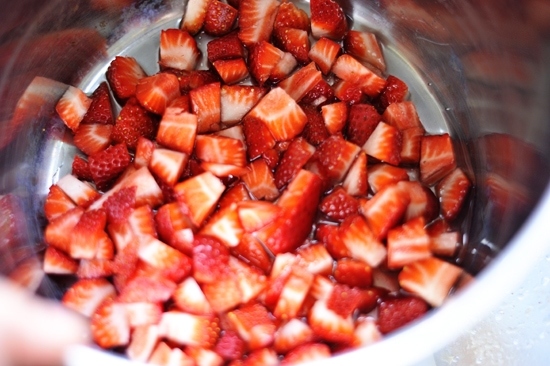 I might have put too much water in when stewing the strawberries.. Could that have made the batch not turn out?????? Or maybe I didn’t have enough fruit pulp? I”m trying to figure out where I went wrong! Love this idea! Thanks for the inspiration! I have a “speed bake” option on my oven, I’m assuming this is like a convection feature. Would this be ok to turn on while doing this, or no? I’m not sure… the idea is that you want your oven to act as a dehydrator, cooking as slowly as possible. So “speed” is probably not what you’re looking for! Chalk this up to poor planning, but as we were making this I noticed that we were out of plastic wrap. I’m using aluminum foil. Do you think this will work? I’ve never used aluminum foil, but if you try it, make sure you grease it well. Let us know how it turns out! Hi! 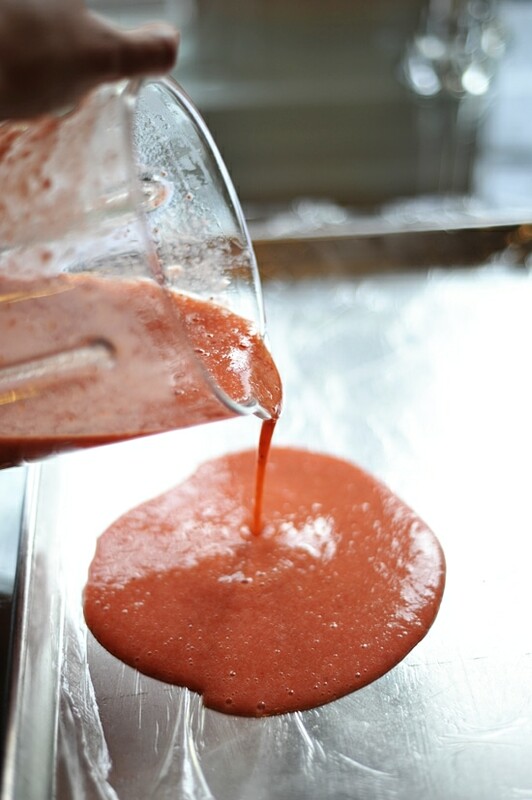 This recipe is amazing and I’m in the first eight hours of the dehydration process but I’ve had fruit leather from the store and it was very thick but from your pictures and your description it seems like the leather will be pretty thin and I was wondering if there was a way to thicken it up? Would you do it by adding more fruit and less water? I am going to try this soon, i wonder if i could sneak in some veggies. anyone tried this? Good idea, let us know how it turns out! How long do these keep? A week or two? It depends on the environment, but that is a good time frame to count on. Also you could freeze them. 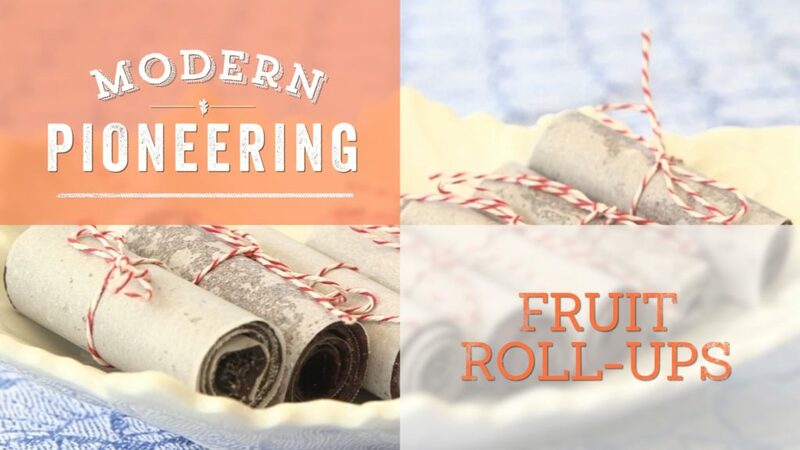 I have to try these, my family luvs fruit roll-ups. can we use a dehydrator? Do you think there’s any harm in heating up plastic wrap in the oven? At that low a temperature the heat isn’t high enough to concern me, but you could use parchment if you’re concerned. I live in Las Vegas and seeing as temperatures here reach about 100 degrees daily during the summer, i am wondering if I can just put a tray outside for the day. Any thoughts? Yes you can, just think about how you can block the buggies. You can skip the lemon all together or use citric acid. It is used to help maintain the color of the fruit once it is dried. Mine turned out awesome! ! 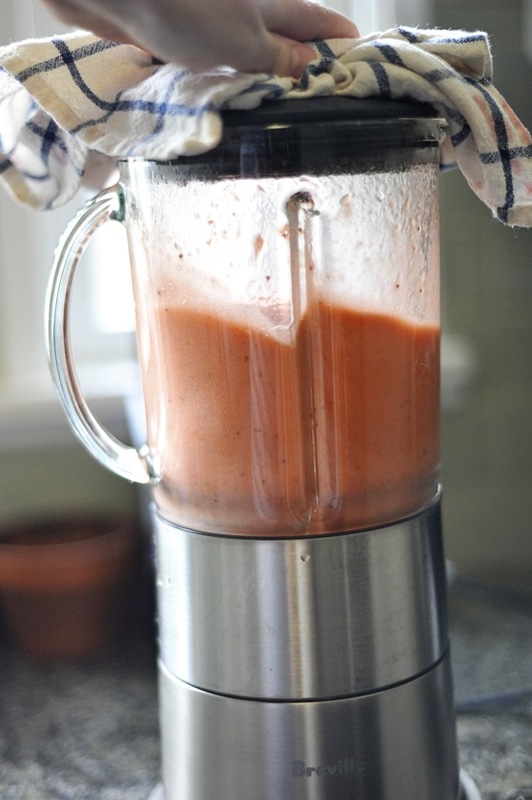 Used nectarine fruit pulp from the juicer and didn’t have to add any sweetener. Silpat really makes it easier to peel off. Thanks! Bravo, love a good silpat! What about a little honey for sweetener? The extra moisture would likely increase dehydration time some but I expect it would taste awesome. what do you mean remove the first lining? Hi, Just wanted to say, when I bought a dehydrator it had a fruit leather recipe, strawberry flavor. 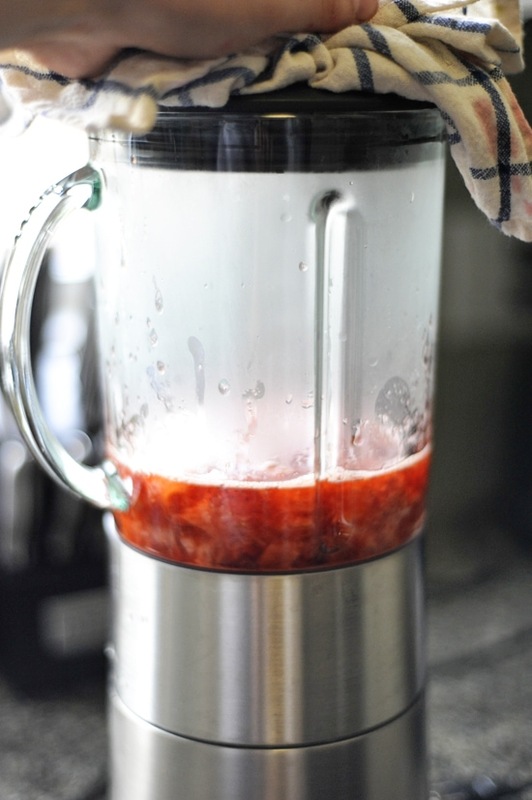 It just had me puree the strawberries with ‘no sugar added applesauce’. Turns out great. I love fruit leather! and this is an awesome how-to! So I tried making this…it was starting out great, started around 9:00 this morning, finished and had it in the oven around 9:30/9:45…by 11:00 it had shrunk and was crispy around the outside, moist in towards the middle. I figured okay, maybe the door wasn’t open enough, drenched it in water and put it back in…around 11:30 I checked it again, still getting crispy, put more water on and turned it even lower than 170* (thats as low as my oven goes), around 11:45 i went back, it looked done (only after 2 hours…even though it was supposed to be 12). It tastes great and is very much like fruit leather, my husband said it was too sweet (only added a touch of sugar), might not add any the next time I make it. Question though…When I poured it onto the pan it seemed really thin and watery. Did I add too much water to begin with? Is that why it was done 10 hours too soon?? Will aluminum foil work? 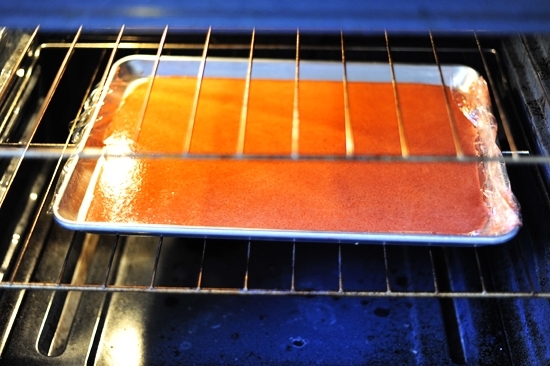 I’m thinking of trying to do this on a cookie sheet with raised edges, cover it tightly with another piece of foil, and let my smoker do the slow heating instead of having the oven on for 16 hours. But I’m skittish of putting it on plastic in the smoker… actually skittish of cooking on plastic in general. I think the foil will get too hot, try parchment paper! Yes, definitely. It’s a great thing to do overnight. It will take about that much time depending on your oven. i made it today on a stone baker with the reynolds baking paper (parchment one side, foil the other) only took 5 1/2 hours for the whole process! The directions do not say what temperature to set the oven at. This sounds great! Do you think an adult version can work by somehow adding champagne? Our even some other type of alcohol? Yup 🙂 My next book has champagne fruit roll-ups in it! Great idea, bet it tastes so nice, I wouldn’t even add any sugar so that it can be a healthy treat, thanks for the detailed instructions and pictures, it helps a lot. What kind a plastic to use???? I tried this with some mixed frozen berries and a squeeze of honey and it came out AWESOME! I used parchment paper, and didn’t have any sticking problems. Delicious and healthy, thank you! Ooh! I love this. My youngest son likes the store bought ones but I hate not knowing what is really in them. As soon as berries come back in season I am going to try this. Maybe throw a couple pans in the oven so I don’t feel so bad about how long it needs to be on for. anyone tried subbing agave for the sugar? I am not sure about agave but if you are concerned with the sugar high’s I would try Fructose crystalline. This is white almost powdered type sugar, it has a sweet taste without any other aftertaste influences like you would get with Agave. This sweetener is actually sweeter than Sugar so you can use about 25% less than you would when using sugar. I have tried this and it comes out fantastic every time. Good Luck and if you try it let me know what you think. Hi! So I am attempting this right now! It smells wonderful so far. I put in everything I could find in my fridge. Strawberries, raspberries, blueberries, apple, green grapes, watermelon, cantelope, and banana. I also put in honey and a smidge of pancake syrup. i have a dehydrater I wanna use rather then my oven. Not sure if I should use plastic wrap or parchment paper on the racks? I hope this works cause it smells great! I’m currently 32 weeks pregnant and I think this is a great snack for me and as well as my 3 year old daughter! 😀 thank u for the inspiration! Hi Samantha, parchment paper is your best option! I thought the same thing. No thanks on the plastic. If I would to place the puree in the sun would it have to be indoors next to a window or outside? And would it have to be covered? In the visual instructions you mention olive oil, and in the written portion below the pictures it says vegetable oil. Which is best? Was wondering how much water you use to stew the fruit in? But what about the plastic? Is there another way to get it not to stick…….I’m not comfortable baking plastic. I so want to do this! I have a lot of sun here in Az so I wont have to heat the darned house. Can I do this with bananas? I have 2 bunches that I was thinking I was going to have to make banana bread with. And can I substitute honey for sugar? I just made these over night and I have to say.. I’m hooked! 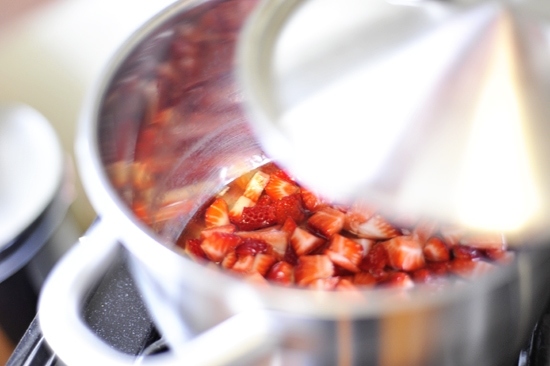 Some info for those reading.. there’s NO info on water amount and no info on how much strawberries pre cooked. This is a problem. Author, I hope you can add this info, it would have helped a lot. So I went for 3 or so cups cut up strawberries and then used too much water and it cooked down a ton so I threw more strawberries in. It ended up working out ok but mine still came out quite thin. I recommend starting with only a couple spoons of water knowing you can add more if you need to and I would def recommend at least 4 cups of uncooked strawberries.. 5 is prob better. In the end, they still taste great and I’m very pleased and will be making them again. I am only curious how much money it cost to keep my oven on for 12 hours..
Hallo, I’ve tried whith apples and a bit of red Fruit, it is very good. Does it work with every fruit? Fruit has it’s own natural sweetness. To keep it on the healthier side I would’t add any ugar or sweetener. we get used to not having so much sugar once we get away from it! Sugar is bad for us!